Now there is a concept… Self-compassion as a self-awareness. 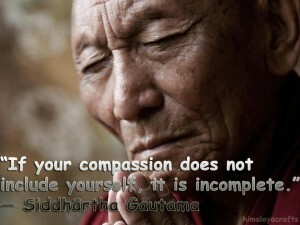 How easily are you able to have compassion for yourself? In my last post I was discussing disappointments. Getting past disappointments may require some self-compassion. How do you show yourself a little compassion? It feels awkward maybe to give yourself compassion, maybe if we were to practice it on a regular basis we’d get more comfortable with embracing the concept. Hello & Happy Sunday my dear Sis Bliss. I have been pondering why this is. If we recognize not only the need for self-compassion, but also the good why is it so difficult to be kind to our selves? Has me scratching my head. Of course there are no doubt a different answer for every person. Thanks sweetie, and right back to you. If you glimpse a Persied meteor tonight, think of me — I’ll be watching too. Was there and had such clear skies. Thought of you and how big yet how small our universe is. We had cloudy skies, but I saw a couple of streaks. I’m going to try again tonight. Me too but will also have clouds tonight. My dear friend – what a wonderful post! Truly inspiring and uplifting. Thank you!!! Where do you find the time to get these touching inspiring together? Thank you. The second greatest commandment according g to Christ is “Love your neighbor as yourself.” Could it be we have difficulty loving others because we have never learned to love ourselves? hello PJ, I think you might have a valid point. If we could love ourselves than I think the natural extension would be easily loving our neighbors. All of them. If we did not hold judgement for ourselves maybe we’d not judge others. I found you on another blog, posting a comment. This is a wonderful, uplifting post! What a beautiful share you gifted my post and myself with. You knowing yourself, and how to assimilate personal conflict while at the same time being loving to your self is a gift you give yourself as well those who know you. As you are my dear friend. Thank you so much for your kindness. Oh my dear friend… once again you have brought me to tears and given me Just what I needed! I have two posts this morning about compassion..back to back from two different people..yup, pretty sure that’s a sign! Hello Wendy my best galpal. So lovely to see your sweetness here too. Thank you for your kind words and isn’t amazing really how this happens? I think not that it was coincidence, Nope! I agree sweetie, you are being given a sign by the universe. Lets together embrace some self compassion, eh? I love you Wendy Just Call Me Wingnut!! Loved it! you are so so good at this. Thank you for this dedication to your followers. My dear Pablo you just make me smile. Thank you so much for taking the time to read LBB, and then commenting too? You are awesome my friend!